The twenty-first century finds civilization heavily based in cities that have grown into large metropolitan areas. Many of these focal points of human activity face problems of economic inefficiency, environmental deterioration, and an unsatisfactory quality of life�problems that go far in determining whether a city is "livable." A large share of these problems stems from the inefficiencies and other impacts of urban transportation systems. Transportation for Livable Cities dispels the myths and emotional advocacies for or against freeways, rail transit, bicycles,and other modes of transportation. 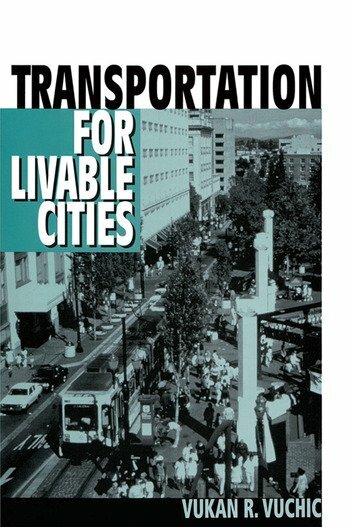 The author discusses the consequences of excessive automobile dependence and shows that the most livable cities worldwide have intermodal systems that balance highway and public transit modes while providing for pedestrians, bicyclists, and paratransit. Vuchic defines the policies necessary for achieving livable cities: the effective implementation of integrated intermodal transportation systems.